DJ Piggy have been spinning records since the mid 90’s and have always had a major passion about music. He even owned his own recordstore at one point (So Real Records). Most clubs in Oslo have been visited by him since the start of his DJ career. And is known for his eclectic style and to adapt and read the crowd. He has always been apart of the music industry somehow. Everything from running his recordstore, working at a recordlabel (PassIt), writing about music (PlayMusic Magazine), selling music equipment (Riff/Ljudia) to now running his own management (AceTomato). This guy lives and breaths music. DJ Piggy‘s versatility is perfect for your party or club. He will make your evening perfect, for your needs! I am Erik Fosland. 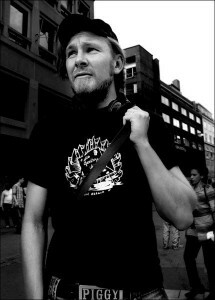 A DJ, Producer, Manager and Musical Adviser from Oslo. And yeah you guessed it, music is my life! The future is free culture & CC!